Hooray, it’s that time of year when we all put our 20BooksOfSummer TBR piles together – I like to know where I am before I start taking the front of my TBR into it, so always save it up until the last minute to plan. First of all, though, here’s the current state of the TBR. I’m currently reading Paul Theroux’s “Deep South”. After not enjoying many of the essays in his later book, I was approaching this with concern, but you know what? It’s BRILLIANT. It’s so good. He goes back to places, something he’s not really done before (OK, he did his “Ghost Train to the Eastern Star” trip, which retraced “Riding the Iron Rooster”, but this time it’s over the course of a year) and is humane, concerned and warm. It’s the only book I’m reading at the moment, but coming up next will be Iris Murdoch’s “The Italian Girl” for my #IMReadalong and the first book in my 20BooksOf Summer. Here’s the traditional start of my TBR, what’s coming next pic. Oh, and this is important, see how absolutely TINY the next Iris Murdoch is. Run by the lovely Cathy at 746 Books every year (here‘s her introductory post), 20BooksOfSummer sees a whole load of us reading, well, 20 books from 1 June to 3 September every year. I’ve been taking part since 2015 (not always successfully) and you can see my master page, where I pull together my reviews and round-up here. I’m being really quite ambitious this year. My PILE is drawn solely from my TBR and doesn’t include Kindle books (I know I have at least three or four to read for NetGalley) or the three Iris Murdoch books I’ll read for #IMreadalong. I am including eight books for August which will also participate in All Virago (and Persephone) / All August, which I do with the LibraryThing Virago Group every year. And I reckon I can do it, especially as I’m trying hard to address my work/life balance, so HAVING to read is a good thing. Amit Katwala – “The Athletic Brain” – About how neuroscience is revolutionising sports science and can apparently even help amateur sportspeople at all levels. Vikas Swarup – “The Accidental Apprentice” – His more famous novel is Q&A, filmed as Slumdog Millionaire. In this one, an ordinary sales assistant is swept up to become a CEO by a billionaire, but why and will she pass his seven tests? George Eliot – “Scenes of Clerical Life” – One of the few Eliots I haven’t read now, her earliest stories of religion, power and love. 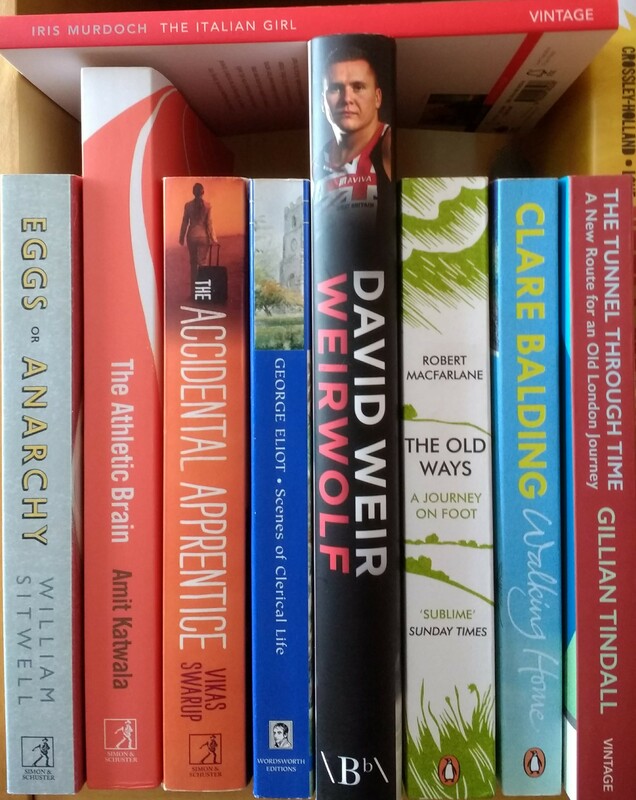 David Weir – “Weirwolf” – The autobiography of the amazing athlete who’s won everything from the London marathon multiple times to Paralympics medals at different distances. Robert McFarlane – “The Old Ways” – I think everyone in the world except for me has read this, where he follows the old tracks, hollow ways, drovers’ paths etc. of Britain. Clare Balding – “Walking Home” – Not a second volume of autobiography but more walking, this time around modern Britain, meeting people. This will either go really well with / contrast with the McFarlane or I’ll get heartily sick of all the walking and have to swap the order! Gillian Tindall – “The Tunnel Through Time” – Looks at the archaeological and sociological evidence uncovered by the building of Crossrail in London as well as historical sources to show who walked those routes and when. Christopher McDougall – “Born to Run” – I think all runners who read have probably read this seminal text on barefoot and ultrarunning (and barefoot ultrarunning), something I really don’t want to do but find fascinating. Peter Ginna (ed.) – “What Editors Do” – Includes a chapter by my friend Katharine O’Moore-Klopf and loads of detail about the work of the editor. Prajwal Parajuly – “Land Where I Flee” – Phew, another bit of fiction at last! Three expats fly back to Sikkim for their grandmother’s birthday. Will they gain her blessing and retain their sanity and escape again? Ellen Glasgow – “Barren Ground” – A 1925 novel detailing the life of a Virginia woman who survives an early disappointment to build her own life. Ann Bridge – “Peking Picnic” – Her first novel, a diplomat’s wife realises the contrast between China and England, along with a cast of fellow English people. She’s such a witty writer and conveys place so well. Angela Thirkell – “Summer Half” – New teacher Colin Keith encounters the terrifying Tony Morland and comedy in the school and village ensues. Angela Thirkell – “The Brandons” – More Barsetshire comedy, with widow Lavinia Brandon batting away suitors while trying to matchmake for the vicar. Tirzah Garwood – “Long Live Great Bardfield” – Wood engraver Garwood wrote this in 1942 as German planes circled overhead, telling of her art and her marriage to Eric Ravilious and the circle of artists around them. I hope this is good because it’s really thick! I’ve just realised this might just fill another year in my poor old Century of Books! Joanna Cannan – “Princes in the Land” – The mother of the Pullein-Thompson pony-book sisters on a woman whose life is centred around her children, who gradually move away from her. Ali reviewed this back in 2016 and was very enthusiastic. Diana Tutton – “Guard Your Daughters” – The One Simon from Stuck-in-a-Book is always pressing onto people (rather successfully!) so I had to get it when Persephone published it. A young girl in a family of sisters narrates their odd life – hard to resist anyway! Enid Bagnold – “The Loved and Envied” – Set in France, Lady MacLean is a fading beauty, still with her courtiers. A slim Virago, received just the other week. What do you think of my choices? Do you think I’ll get through them all? 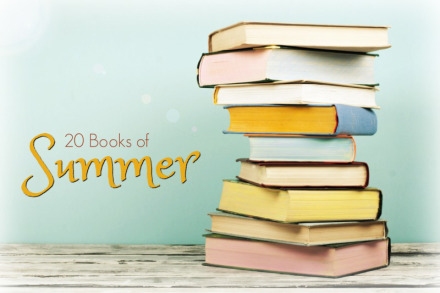 Are you doing 20BooksOfSummer, too? Hey, I have that Ikea duvet cover too 😉 And it’s not the first time I’ve spotted it in a fellow blogger’s photos! I’ve read the Macfarlane from your selections, but that’s it. Oh, that’s funny! I wonder who else has it! I thought it was a big over-flowery for my taste but Mr Liz was very keen, and we do like it. I said everyone had read the McFarlane and you are proving me right. Did you enjoy it? Lucy of Literary Relish also has that bedding. It’s not on our bed at the moment, but we use it frequently. Actually, it was my first Macfarlane and I wasn’t that fussed. But I went on to be bowled over by Landmarks. Oh, that’s interesting, I’ll not be sad if I’m not bowled over by him then! I’ve put on a wish list at Book Depository Eggs or Anarchy and The Old Ways! Thanks. Have fun with all your wonderful books! Ah, terrible temptations these lists are, aren’t they! I hope copies find their way to you in time! Looking forward to your reviews. I don’t read Running books (I’m not a runner) but other than that, some interesting books on the horizon. Happy reading. I’m often not the sort of runner I read running books about, if you see what I mean! But glad there’s a nice variety to pique everyone’s curiosity. Oooh, lovely pile of books – good luck! I’ve read The Old Ways, my only Macfarlane, and like Rebecca I wasn’t fussed. In fact, I came out of it a bit negative and I’ve never read anything else by him. But I’ll be interested to see what you think about him. Again, proof that everyone has read him except me!! I hope I get something out of it. At least I read quickly … Have you read any of the others? Only Guard Your Daughters, which I loved! Read it back when Simon started raving about it! Yes, I am v late to that particular party, too! Love PRINCES IN THE LAND–read it twice.And i bought GUARD YOUR DAUGHTERS for 50p a decade ago–still not read it. Two good books and nice finds, although I haven’t bought a Persephone book for myself for years as I and my friends tend to buy them for one another. Good luck with your 20 books of summer you have a great pile of books there, a real variety. Look forward to your reviews. Thank you, I think I have got a good variety, 10 non-fiction and 10 fiction, about 7 by men, and Viragoes, travel, running, classics and social history. Good luck Liz – we’ve got this!! We HAVE, haven’t we! Go go go, etc. 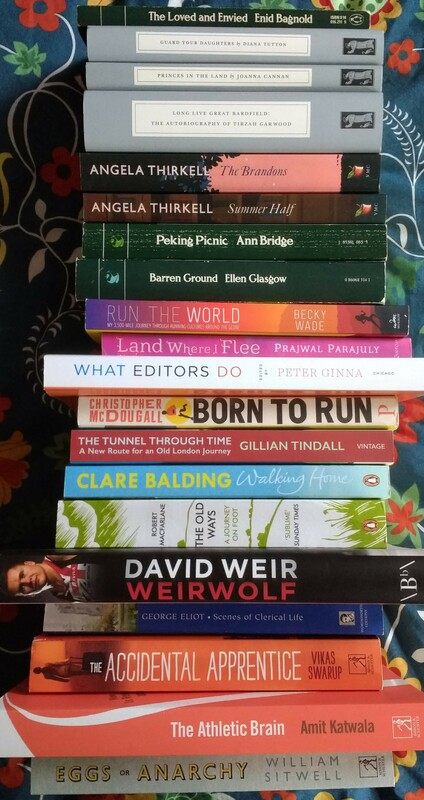 I also have ‘Born to Run’ on my tbr pile – quelle surprise! That’s a fabulous stack of reading you have there. I’m still in two minds as to whether to attempt this challenge or not, but you’ve definitely tempted me, especially seeing all those green and grey spines together! We’re probably the two people left to read that one! Do join in, you can still! Yep, I’ve decided to have a go, after all! Who knows, I might manage it, and at least I’ll have fun trying. That would be marvellous! I’m not really at much distance at the moment and very happy to meet people for a run whether it’s a race or just a run! I’m so pleased I could cheer Lisa by sharing your review and knew she’d pop by once I’d alerted her. Hooray! I haven’t read The Old Ways either! I’m impressed that you’re planning on reading these 20 books + your IM books + some kindle reads!!!! I have a Thirkell on my list – it will be my first Thirkell. Yeah, I’m not sure how that’s going to work out, however I have dialled back on my work schedule and getting loads of reading time this weekend, which should help. Lots of goodies on your list; Angela Thirkell never disappoints. Yes indeed, and having her come in the last month will make for some nice quick, easy wins there! I hope you enjoy all of the books that you’ve picked for the 20 Books of Summer challenge. I’m doing the same as you and attempting to read 20 physical books to try and make some headway with my TBR (and overflowing bookcases! ), but I do have some NetGalley books to read as well so there’s lots of lovely reading to be done over the summer. Your piles o’ books are looking great. Of course, I just won two more NetGalley books, of course I did, but one is an Amish romance (if I have a guilty pleasure, that’s those!) and one is a running book I think some others are reading in July, so that will be fine. I do like to have a physical pile. Good luck with yours! I love Thirkell and have read quite a few and have others waiting to be read. I’ve also enjoyed several of Ann Bridge’s books. I read Tirzah Garwood’s book and liked it very much. Yes, it’s long, but it’s fascinating. Ah, that’s good to know, thank you. And yes, Thirkell will be a great easy win late in the challenge! An impressive looking book stack there – enjoy your summer of reading! Fortunately, I’m not doing too badly with NetGalley at the moment – I’m on an 85% ish review level so not feeling too much pressure, and the two to read in June are both fiction. However, I might regret going all physical, who knows! Wow! Liz, you do set yourself hard targets – wishing you good luck in achieving these ones. The only name that caught my attention was Vikas Swarup. I so thoroughly enjoyed his Q & A and was bitterly disappointed in the ‘Slum Dog Millionaire’ cinematic film version. It so completely missed the reasons why the young quizzer was able to answer the questions. Total shame on the film producer. Hope is all well in your part of the world, as it currently is in ours. Keep reading and writing please. I didn’t see the film of Slumdog though I think my husband did: I don’t like seeing films of books I’ve liked. I am curious about this one as have heard nothing about it, I just spotted the author and picked it up. I’m glad you’re reading well and having good time for it. All is well over here, thank you, with adjustments to the work-life balance making things easier after a tiring early part of the month. I’ve read the running books and you won’t be disappointed in any of them! Aha, great stuff, thank you! And of course now you’ve “done” him, I’ve been approved for the Amby Burfoot: will probably read it alongside Cari and/or the Facebook group. I love the idea of a dead tree version of this as I really need to move some titles along. I’ve been failing BC way too much of late and I hit the Strand and and… Doesn’t help that I got a purse that can fit a book either. It would be fun to have you doing it, too. It’s also very relaxed, doesn’t matter if you “fail” and you can choose to do 10 or 15 books or swap books out (I’ve done the latter every year!). Thanks, I hope I can manage it, with all the extra reading I have planned outside the challenge, too!